If you’re using or thinking about using a deep cycle battery, you’re also going to need the best deep cycle charger money can buy. These products will ensure your battery’s always ready to work at any given moment. But there’s an issue with trying to find a high-quality deep cycle battery charger. You see there are too many options to choose from as a potential buyer. And trying to find the perfect one among this mess of choices is almost impossible. This issue is the reason why we decided to develop the article you’re reading at this moment. It’ll take you through all the necessary information you might need to know about these products. We’ll even provide you with reviews of the battery chargers we see as the best on the entire market. All this information will help you understand what you want from one of these products. And once you get a grasp on the features and such, the perfect choice will become clear. It might even be one of the chargers we review in the next section. So, let’s get to the reviews and get this process underway! 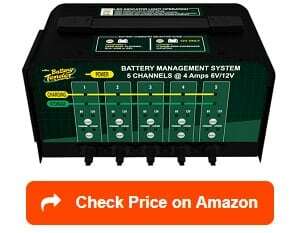 In this section, we’ll provide you reviews of the ten deep cycle battery chargers we see as the best on the market. From these discussions, we’re hoping you’ll start to understand what a high-quality example of these products might look like from a customer’s perspective. 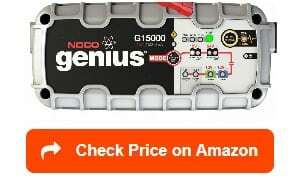 Our first product is the NOCO Genius G15000 Pro Series UltraSafe Smart Battery Charger, which makes use of some of the safest and advanced technology in the world. I mean, the versatility alone is enough of a selling point. After all, this charger is capable of working with automotive, marine, power-sport, RV, and deep cycle batteries. It’s hard to see how you wouldn’t find multiple uses for this fantastic product. I also find the external mounting and rubberized base to be incredibly beneficial. You see these two features will help this NOCO battery charger avoid surface slipping and scratches. Its water and UV resistance capabilities are lovely qualities as well. With these protective aspects, there isn’t a scenario where I won’t be able to use this product. As a result, if it’s raining outside, this charger will still provide high-quality performance with its 15 amps of power. It’s also nice that this product offers protection against numerous potential issues: overcharging, short-circuiting, overheating, and sparks. The smart battery inside this charger is another critical factor that stands out about the product. This feature will ensure it consumes the least amount of energy possible as well as increases the performance and longevity of your battery. It even comes equipped with an intuitive LED indicator, which will keep you up to date on all the necessary information about the charging process. 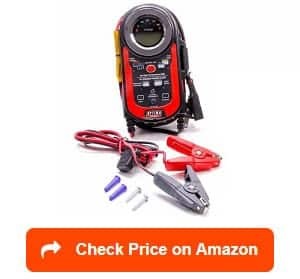 This charger also includes the addition of both high-quality X-connect battery clamps and integrated eyelet terminals, which make it easy to use. 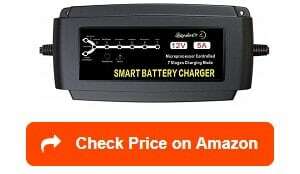 Overall, this product seems to cover every base you could want from a deep cycle battery charger. I mean, the manufacturer even added in a 5-year warranty to offer you some protection in the event some bad happens with the product. But there’s one significant issue this product has that I can’t look past as a potential customer: its price. It’s wildly expensive, which is a product of its higher amperage level and world-class features. The next product on our list is the LEICESTERCN 12V 5A Automatic Battery Charger, which has a set of features anybody looking for one of these products would love. One of these qualities is the LED light visual indicator. With this indicator, you’re able to track the entire 7-step charging process. It’s a convenient feature that makes this whole experience much easier. Along the same lines, this model also comes with three different kinds of battery clamps. This inclusion might seem excessive, but it gives you the option of choosing the battery clamps that are ideally suited to fit with your equipment. It’s another convenient addition, which conveys this manufacturer’s willingness to put the customer’s needs first. These clamps make the using process incredibly easy as well. And as someone that doesn’t always do well with mechanical things: a simple operation device like this product is something I find extremely appealing. It also helps the whole charging process is automatic, which takes the burden off you. All you have to do is sit back and let this charger do all the work. Sounds great, right? Well, it is, and the automatic process will help lengthen your battery’s life as well. The fact that it’s made with durable materials and has multiple levels of protection aren’t too shabby either. I mean, this charger has a fully sealed outer case, which will prevent any damage that might come from a myriad of issue-causing things: water, dust, oil, moisture, corrosion, etc. It seems LEICESTERCN did an amazing job crafting a deep cycle battery charger that’ll offer high-quality performance for a long time. But this product isn’t perfect as there was one issue that seemed to haunt the experiences of a few customers. You see this model doesn’t come with a manual and has the instructions listed on the charging unit itself. Several customers found this aspect annoying and made the instructions hard to follow. 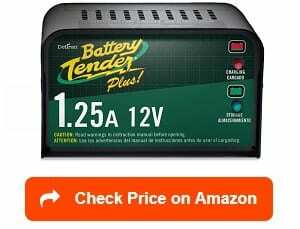 This next product from Battery Tender is one of the most efficient models on this entire list. You see even with an amperage of 1.25 amp this charger still outperforms almost every model with a 3 amp rating, which is incredible. It also has a quick connect harness, which makes this product have a simple using process. This feature will even make the hardest connections simpler with its design. Honesty, this quality can be a godsend in certain situations. You should take comfort in this charger’s 10-year warranty as well. This amount of years on a guarantee isn’t something you often see within this marketplace. As a result, you can reasonably expect this manufacturer to have your back when/if something happens with the product. It’s also beneficial that this charger automatically changes to float charging mode when the battery is fully charged. In other words, this feature will ensure you don’t overcharge your battery, which can cause a heap of issues. In the same regard, this product has protection against short-circuiting and accidental sparking. The reverse polarity preventative is a nice touch as well as it ensures the user’s safety during the charger’s use. This product has a couple of add-on inclusion that you shouldn’t overlook either: alligator clips and ring terminals. Both these features make the using process much easier and add a certain level of convenience for the person that buys the product. Overall, this charger’s a solid option that’ll more than meet your expectations. But there are two issues you should be mindful of before you buy it. The first issue is some customer reported durability concerns with the charger not lasting as long as they wanted. Not something you like seeing in a product you’re considering. The second issue is this product isn’t water resistant, which is more of a personal preference issue. The BLACK+DECKER BM3B Fully Automatic 6V/12V Battery Charger is one of the more convenient models on this list. For instance, it can charge batteries inside a variety of different vehicles: RVs, cars, motorcycles, ATVs, snowmobiles, lawn mowers, and boats. This product’s convenience level is further showcased through its easy connection process thanks to the additions of both battery clips and battery ring terminals. It’s little details like the inclusion of these two features that proves this manufacturer has their customer’s needs in mind. It’s also essential we mention that this product has a built-in mounting bracket, which further shows the connection/using process is unbelievably simple. I found the multiple levels of protection this charger offers to be appealing as well. You see this product ensures the user won’t have to worry about overcharging, reverse polarity, or short-circuiting causing them any issues. It even will automatically switch over to float charging mode when the battery reaches full charge capacity. But the best part about this model is the low-price. 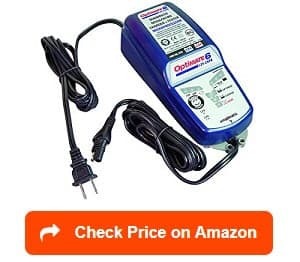 In fact, this charger is one of the least expensive on this list. And given its high-quality features along with this low price tag, I think it’s fair to brand this product as a bargain buy. The manufacturer was kind enough to throw in a 1-year warranty as well. It’s a rather small amount of years, but any insurance is better than none. However, I sadly didn’t enjoy everything about this product. There were two things I found concerning during my research: no water resistant capabilities and a low amp rating. These features don’t mean this product is low-quality. But if I had my druthers, these two qualities wouldn’t be a part of any charger I’m looking at buying. Our list continues with another high-quality product called the BatteryMINDer Model 1500 12V 1.5 Amp Battery Charger. And this particular charger has a whole slew of things about it that made me highly intrigued. For example, the full-time automatic high-frequency pulse de-sulfator was one of the first things that stood out to me. You see this feature allows this charger to extend your battery’s life by four times, which is astonishing. This feature also helps recover weaker batteries, which is a nice touch this device offers. It’s quite apparent this manufacturer was trying to make the most user-friendly battery charger and this aspect certainly move it towards that title. The charger’s versatility helps in this regard as well as it blew me away with its ability to work with a variety of different batteries: 12V flooded, maintenance-free, deep-cycle, Optima brand sealed AGM, marine, and sealed batteries. Given this information, it’s not entirely shocking that this charger is one of the best-reviewed products within its marketplace. I’d imagine this status has to do with the fantastic levels of protection it offers as well. These protection capabilities include prevention against things like short circuiting, reverse polarity, overcharging, overheating, and undercharging. In other words, everything you think could go wrong with one of these devices is accounted for with some level of protection. But it was disheartening to see one thing that kept being mentioned in the customer reviews; it seems the customer service was an area where this manufacturer wasn’t excelling, and a lot of people felt underwhelmed. This area isn’t something a leading brand should be struggling with, and it was a massive bummer for a product I was loving until reading those complaints. The Schumacher SE-1-1-12S 1.5A 6/12V Fully Automatic Battery Maintainer is a device everyone that’s looking for a deep cycle battery charger needs to consider. I mean, it has a great set of features and a reasonable price tag. What more could you want? After all, this charger reeks of convenience with its easy mounting process thanks to the inclusion of both the cable tie and double-sided adhesive. Plus, you can mount it almost anywhere including battery trays and fender walls. It also features a plastic case that’s resistant to a whole lot of issue-causing things: gasoline, oil, acid, solvents, water, and acid. As a result, you can expect none of these potential problems to end up breaking your new charger. I like the always important inclusion of the float charging mode as well. This feature will not only ensure the amperage will taper down once the battery’s fully charged; but it’ll also offer reverse hook-up protection. The multi-stage charging process is another great addition as it’ll extend your battery’s life and ensure the safety of the entire process. With guarantees like these two, it’s hard not to be intrigued by this Schumacher battery charger. And I didn’t even mention that this product has the capability of working with a myriad of vehicles: motorcycle, power-sport, RV, and cars. Honestly, there isn’t much you can complain about with this particular device. But there was one aspect that I didn’t enjoy seeing when I was doing my research. You see multiple customers reported longevity concerns with the product and it would stop working after a few months. Of course, we should mention that these experiences were few and far between among the customer reviews. But the complaint was frequent enough that it was worth mentioning in this article. This next product will provide you with a using experience that’ll more than meet your expectations. 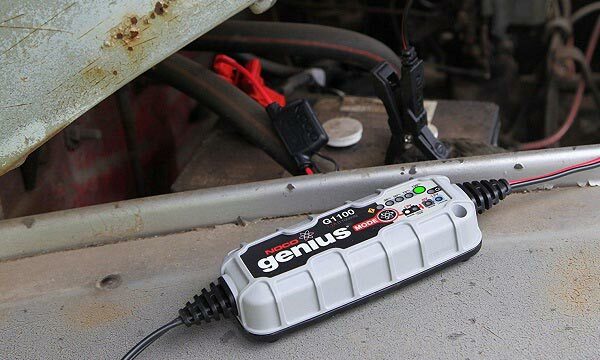 It has a set of features that easily makes it one of the best deep cycle battery chargers on the market. One of these standout features is the LED charging gauge, which has an LCD display. This crucial piece allows you to quickly evaluate how the charging process is going by just holding in your hand. 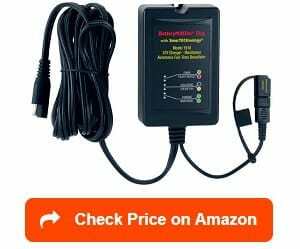 This feature also makes this 12v deep cycle battery charger have an easy operation process as it’s all controlled by this part of the device. Plus, it features a quick-set battery type selection button, which further proves the high-quality of this model. Overall, it’s an incredibly convenient feature that gives you a sense of control over the entire process. I also like this Optima battery charger’s built-in health mode, which lengthens your battery’s life and optimize its performance to the best of its ability. These two aspects alone make this model a must consider option. But the features don’t stop there as this product is known for recovering weak or discharged batteries other chargers just can’t. Its use of spark-free connection technology is another beneficial feature this model has to offer. I mean, this technology will ensure you won’t have an issue with any sparking when using this device. We should mention that this charger works well in a couple of different situations as well: as a marine battery charger, an RV battery charger, a motorcycle battery charger, or an AGM battery charger. And it’s capable of bringing its high-level performance to each circumstance. But it’s essential you understand this level of performance isn’t something that’s going to come cheap. You see this charger is one of the most expensive on this entire list; therefore, you must decide whether or not the extra features are worth the large amount of money. The Optimate 6 12V-24V Battery Charger is a perfect option for anyone needing a deep cycle battery charger. This product is aptly suited to thrive in those circumstances with a set of features that will blow you away. You see this charger has the capabilities of charging either a 12V or 24V battery and keep the same performance in both situations. But the best part about this feature is that when/if you accidentally select 24V and you’re charging a 12V the device itself will warn you. As someone that’ll most likely make this mistake, this feature’s inclusion is certainly something I appreciate greatly. I also found the automatic shutdown feature to be appealing as it’ll ensure the process stays safe by shutting down when detecting a short circuit. The waterproof materials used in creating the case was a nice touch as well. These materials will ensure this device can function in temperature as low as -40 degrees Fahrenheit. Of course, I don’t intend on testing this quality out, but it’s nice to know its there. This charger also features a 3-year warranty, which should offer you some coverage when/if something happens to the device. These types of warranties make me feel better about buying products as well as it conveys the manufacturer has some faith in what they’re selling. Plus, it’s helpful that this charger is exceptionally adept at recovering discharged batteries, which could provide huge dividends when your battery fails. In the end, this device pretty much has everything you could want in one of these products. But it does have two problem areas that I didn’t enjoy seeing when I was first researching this device. The first is a rather simple one; it’s expensive and way outside my budget limit. The second issue is a bit more severe as multiple customers complained about the customer service. 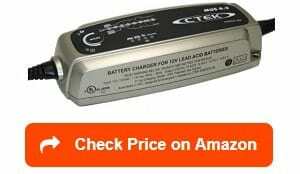 This CTEK battery charger will help solve a multitude of issues that might be affecting your battery. You see this device comes with an 8-step process that’ll extend your battery’s life and maximize its performance. One of these steps is a de-sulphation process, which I found incredibly interesting as it’s capable of removing the issue-causing sulfate from the lead plates. In other words, it solves the issue that’s sucking the life right out of your battery. I also thought the special reconditioning function was an impressive feature as well. This charger uses this function to retrieve deeply discharged batteries. As a result, this device could be unbelievable beneficial when your battery does end up failing. This charger also provides several levels of protection to ensure the charging process ends up being completely safe. For instance, this model is spark-proof, short-circuit proof, reverse polarity proof and has built-in overcharging protection. It even has water, dust, and splash resistance to make further sure nothing terrible happens when you use this charger. And if something does happen, it backs it up with a 3-year warranty, which should offer a significant amount of protection itself. I didn’t even mention that multiple customer reviews commented on how easy this device was to operate. Given my need for simple battery charger, you can imagine I appreciate seeing a feature like the LED display, which makes this operation process easy. But there were some concerns within these customer reviews as well. Some of them reported issues with this device’s durability with the product not working after a few months. This type of issue isn’t something a potential buyer wants to see when they start reading the all-too-important customer reviews; however, we should acknowledge that this issue was present in only a small number. The last charger on our list, the Battery Tender 5-Bank Lithium Selectable Commercial Battery Management System, is a unique product that allows you to charge five batteries at once. But this feature isn’t the only special thing about it. It also has various other features that make it stand out. For example, its 4-step charging process will ensure each battery connect to the charger will be maintained at their highest levels of performance. And it does this ability without allowing any of them to overcharge. This model features a 72-hour safety timer, which I found appealing as well. You see this part of this device makes sure the batteries reach float mode status, which will ensure they taper down gradually as they grow closer towards being fully charged. Its other safety protection qualities aren’t something you should overlook either; this device features reverse polarity protection and spark-proof connectors too. Both of these aspects will provide you with a sense of being safe when you’re using this charger. Along the same lines, the 3-year warranty will offer this feeling as well. It’s quite clear that there isn’t a single safety precaution this particular manufacturer missed when creating this device as it seems like it’s prepared for everything. It also helps that it has an LED indicator design for each charging bank, which makes it easy to keep updated on how each charging process is going for the separate batteries. The inclusion of the 6-foot lead and battery clamps aren’t bad additions either. The only downsides this product has have nothing to do with the product itself. They instead revolve around the extremely high price tag and customers reporting issues with customer service. If you plan on buying one of these products, certain factors will shape this decision. And this part of the article will thoroughly guide you through these things to ensure you end up with the best deep cycle battery charger on the market. Setting up a budget is a fundamental step in the process of finding the perfect deep cycle battery charger. Like many other products, these items are available for numerous different price tags and having a budget can help limit your options. This limitation of these options will help make this entire process seem less overwhelming. After all, the amount of options you have to choose from is somewhat insane, which makes anything that can lessen your choices essential. But the primary goal of this budget’s to find the most cost-effective option that possesses all the features you deem necessary; therefore, this process will come down to you being realistic about the things you want and the price tag those qualities require. For instance, if you want a charger that’ll monitor the battery life itself, it’s going to cost more money than a standard model that just charges the battery. And you’ll have to factor things like this feature into your budget. Some of these chargers will feature aspects that’ll make them usable outdoors. These qualities will be things like water resistant capabilities and UV ray resistance. Others won’t be able to handle harsh environmental elements like exposure to a rainstorm. If you want a charger that can work in the pouring rain, you’ll have to accept it’ll cost you a bit extra. In my opinion, I’m always going to opt for a product with both water and UV resistance that way I know I can use my charger regardless of the weather conditions. I mean, I don’t want to be stuck in a rainstorm with a dead RV battery. This situation just sounds like an absolute nightmare and one I’d like to avoid at all costs; therefore, it looks like I’m going to spend those couple of extra dollars. If you hate the idea of having a battery dying a few hours before you expect, a charger with the ability to monitor your battery’s charge level could be a godsend for you. You see these models will automatically add some additional power when they sense the charge level is getting too low. It’s another feature that will end up being a little bit more expensive; but if you don’t feel like regularly checking the battery yourself, this advanced type of charger could be worth the extra money as a consumer. One of the more important things you’ll have to consider is your battery’s chemistry. Some chargers are suitable for use on only certain battery types. For example, there will be products that charge lead-acid batteries but not gel battery units. And if you do use these chargers on a gel battery unit, you can expect some severe consequences that you just don’t want to experience; however, this situation doesn’t apply to all models that can charge lead-acid batteries. Given this information, reading the product description becomes necessary for all the deep cycle battery chargers you consider. 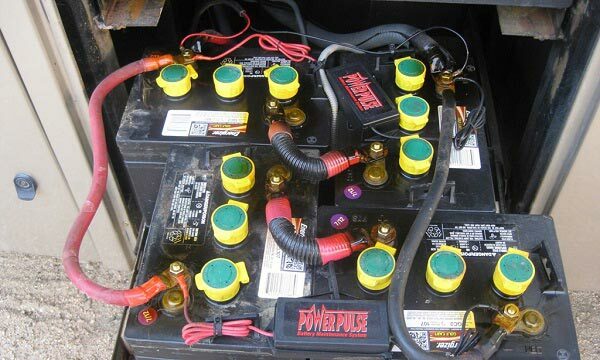 And obviously, understand what type of battery your RV runs off of is something you have to figure out as well. The more advanced deep cycle battery chargers contain the capability of equalizing. This feature means the product can extend your battery’s life by balancing the charge, which reverses the damage sulfation has done to the plates. It’s a rather useful feature that could help get the most out of your charger; however, it’ll come with a hefty price tag, which could put kind of a hole into your bank account. But I think the extra cost would be worth it with a feature like this one. In fact, I’d opt for a charger with this capability over a bargain buy option that doesn’t have it. It seems to me like it’s that essential and necessary for something as crucial as your RV’s battery. And the last thing you should consider is the battery’s size. In the case of batteries, you don’t measure size by the physical dimensions, but rather amp hours it can store. A normal amp hours you’ll see on batteries is 50 amp hours. This 50 amp hour battery will get charged fully in six hours by a 10 amp charger. Likewise, a 100 amp marine battery will need 11 hours to charge with the same charger fully. It’s something you’ll need to think before making a final decision regarding, which charger is the best one for you. This section will go over all the background information you might need to know about deep cycle battery chargers. In other words, it’ll get you up to speed regarding all the other knowledge that’ll help determine, which charger is the best one for your circumstances. Understanding what a deep cycle battery charger is quite simple. It’s a charger designed to charge deep cycle batteries. And in being so, these products have certain qualities that help make that job easier. For instance, a deep cycle battery charger will have thicker plates as compared to the more common lead-acid battery chargers. These plates will also tend to be solid rather than spongy like on other battery chargers. These qualities are different on deep cycle battery chargers because it helps to charge your RV’s deep cycle battery much faster. In the end, these products have a singular purpose ensuring your RV’s battery gets charged as efficiently and quickly as possible. As a result, finding the best RV battery charger should be a top priority for an RV owner. It can make your life on the road much easier and ensure your RV’s battery never runs out of power because it’s undercharged. 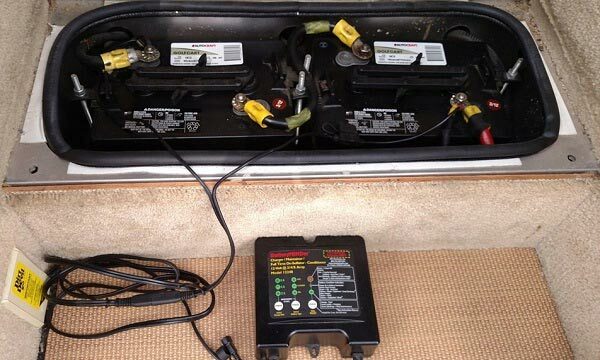 The primary purpose of a deep cycle battery charger is charging your RV’s battery back up to full power. It will also ensure its charging rate is as efficient as possible. And the best models will make sure the device stops working when the battery reaches full charge. These are the main functions of the best deep cycle battery chargers. Of course, the actual process features a lot more scientific words, but these three functions are the general gist of what you can expect out of these products. We should mention that some of deep cycle battery chargers also work on other types of batteries as well; therefore, you might get more use out of these products then you might have expected at first. What are the different types of deep cycle battery chargers? There are numerous different types of deep cycle battery chargers you’ll have to choose from as a customer. Each features its own set of qualities that could lend themselves remarkably useful to an RV owner with a deep cycle battery. For instance, there are deep cycle battery chargers that are known for their quick charging ability. Some other types will monitor the battery’s energy level that it’s charging. These chargers will taper off when the discharge reaches 80% to 90%, which helps stop overcharging from happening. And since you want to avoid overcharging your RV’s battery as much as possible, you can see how these chargers would be useful. The deep cycle battery charges with automatic capabilities are helpful in this regard as well. You see these type of charges automatically switch over to the floating mode when needed. This ability allows them to charge the battery when it’s required. But these products aren’t a long-term solution as you can’t use them indefinitely. Why do you need a deep cycle battery charger? The reason you need a deep cycle battery charger is because a 12V car battery charger or other car battery chargers aren’t all suitable for use with deep cycle batteries. You see these type of batteries are a lot different than your standard car battery. These are just some of the electronic appliances you might find use these type of batteries. And deep cycle battery chargers are designed specifically to handle the unique requirements that are needed for charging a deep cycle battery. 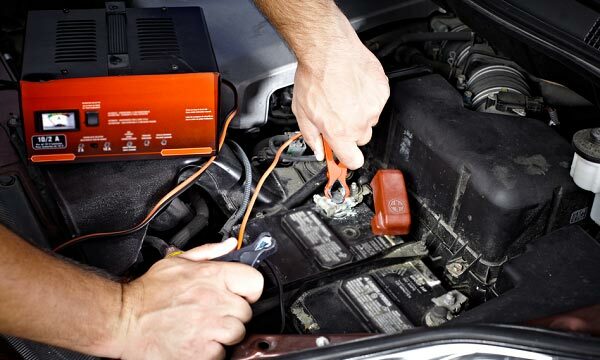 I know, this conclusion seems vague; therefore, we’re going to dive a bit deep into this topic by highlighting the differences between a starter car battery and deep cycle battery. And how it becomes clear that a deep cycle battery charger is a must-have purchase. The first thing you’ll need to understand about why you might require a deep cycle battery charger is recognizing the difference between a starter battery and a deep cycle battery. Starter batteries are the ones heavily featured in trucks and cars, which supply high current power bursts to start the vehicle up quickly. Once the truck or car’s engine started, the alternator then takes hold of the entire process by providing power into the vehicle’s internal electrical system: recharging the battery. This process is the reason why most starter car batteries can go through its entire lifespan without going under 20% charge. But a deep cycle battery has more advanced needs that you need to meet, or the battery will end up failing and deteriorate. Neither of these scenarios is ideal, and the best deep cycle battery charger will take much of the maintenance required to keep up with a deep cycle battery’s needs. In other words, you’ll get to spend more time on actual fun things rather than worrying about recharging a battery. It’s also essential you understand that deep cycle batteries charge faster and tend to have longer lives when they’re recharged based on their unique temperament and battery chemistry-dependent schedule. The perfect charging situation would be having 75% of the battery charged at 50 amps and 15 volts during the initial bulk phase. From there, the leftover 25% will charge at a lower amp level until the battery reaches the coveted 100%. But the process doesn’t stop there as when you hit the full charge mark there has to be a voltage reduction, which is regulated by the maintenance float phase: this phase ensures the battery doesn’t lose any electrolytes. Doesn’t this process sound exhausting and incredibly time-consuming? This overwhelming feeling can disappear incredibly easily by letting a deep cycle battery charger do this entire process for you. And in the end, this reason is why getting one of these products becomes such an essential part of the RVing experience. It makes sure you don’t have to spend a vast amount of time worrying about something as fruitless as recharging your battery. As you probably expected, the FAQs section will try to answer any remaining questions you have about these products. From the following discussion, we hope we can offer some clarity on any concerns you have regarding deep cycle battery chargers. What are good deep cycle battery charger brands? One of the essential parts of this process is figuring out, which deep cycle battery charger brands are the high-quality ones. And all the manufacturers mentioned in our product review section belong within this category. But even among this small group of brands, there are a few that stick out a bit more: NOCO Genius and Battery Tender. Below, we’ll provide you with some background information about each company to showcase why they have such an excellent reputation among their customers. This company has been creating fantastic products for a long time. In fact, their company goes back to 1914. And they’ve been able to stick around because all their products are built with a sharp focus and an innovative mindset. This type of design has made them push the boundaries of what’s possible; but even when they’re pushing limits, this brand never forgets about the most important aspect, their customers. As the only brand that’s featured twice in our product review section, you can tell we think incredibly highly of Battery Tender. This sense of regard for this company comes from their willingness to assure their customers that they’re getting the high-quality product possible. If you end up buying a battery charger from either of these two brands, there’s a high likelihood that you’ll end up with a positive experience. Honestly, this scenario will most likely happen with any of the companies mentioned in our product review section. Remove the battery and transport it to a dry, clean area that’s isn’t too stuffy or constricted. Take out your flathead screwdriver and use it to remove the battery cells’ covers. These covers will have one of two forms: individual plugs or one large cap that’ll cover all the battery cells. Please ensure you’re wearing both eye protection glasses and rubber gloves during this process. There’s a possibility the acid inside these cells will splash out when you’re trying to remove the cover. Grab your hydrometer, put its tip into the cell, and draw fluid into it. Read the hydrometer’s findings by using the instructions that come with it. Some of them might use floating balls to specify whether or not the cells have too little water. Others will have a needle gauge instead. You see there needs to be a specific amount of water in the cell, or the battery won’t work correctly. If it turns out the cell doesn’t have enough water, add the appropriate amount of distilled water. Once you made sure each cell has enough water, recap them. Locate your charger and set it to the trickle or slow charge mode. You should also choose what type of battery you intend on charging: 6, 12 or 24 volts. If you have a battery charger that allows you to set the voltage for the charging process, make sure it’s at 20% of the battery’s amp per hour rating. This measurement will be written on either the side or top of your battery. The next step is connecting your charger’s cables to the battery’s terminal posts. You must ensure you first connect the positive cable to the positive terminal. If you don’t know what the positive sides look like, they typically have a plus sign or red wire coloring. From there, do the same with the negative cable and terminal. Once both ends are connected, turn on your charger. You should wait about 20 minutes or so and then check your charger’s charge meter. This amount of time should be enough for an accurate reading of your battery’s charge level. If your charger has a voltage regulator, this next part of this process will be handled for you as it’ll automatically shut off when it hits the required voltage. But if you don’t have one, you’ll have to monitor the charge meter hourly until the battery’s fully charged. And when it reaches full battery capacity, disconnect it. Reading a battery charger’s amp meter is easy. You see this amp meter is showing the amount of current the charger’s transporting to the battery. At first, there will be a high current level outputted by your charger. For example, if you choose a 12-amp rate to restore the battery, the needle will first be closer to the 12 on the meter. But as the charging process gets going, the needle will start moving and will eventually drop to the number that represents half of your selected amp rate. In this case, the number would be 6-amps. Once it hits this mark, the battery’s fully charged. 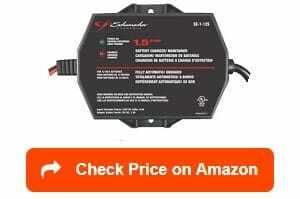 The best place to buy a deep cycle battery charger is Amazon. Their marketplace will have the largest selection and lowest prices among any places you might find one of these products. After all, there’s a reason all the models in our product review section link towards their site. Of course, there are other options worth looking into as well. Stores like Lowes, Walmart, and Home Depot should have a variety of chargers to choose from and offer customer service you don’t get with online shopping. But the selection will be more limited than you might encounter with an online shopping marketplace like Amazon. It’s essential we note that their products will most likely cost more as well. If you don’t like either of these options, you can try going to your local RV store. These places should have some high-quality models, and you could get advice from people that deal specifically with RVs. You should also check out sites like Batterymart.com, which will have a whole slew of options that’ll more than meet your expectations. But this site will often feature higher price tags than the Amazon marketplace. However, it’s imperative you check out all these options before making a purchase. This action will allow you to evaluate, which place offers the best value because the prices can differ drastically between these marketplaces. So please, do yourself a favor and ensure you check out all these options before investing your money into a product. After all, you never know when there might be a sale happening, which could end up saving you a truckload of money. And lastly, don’t ever buy from the manufacturer’s website as the prices on them tend to be significantly higher than anything you’d find at the stores or sites mentioned above. You’ll just end up wasting money on something you could’ve bought for cheaper somewhere else. Since you’re now full of knowledge about these products, finding the best deep cycle battery charger shouldn’t be much of an issue. All you have to do is use the information from this article, and you should be well on your way. If you have any more questions, feel free to ask them in the comment section below. We’d love to help you with whatever issue or concern you might have about this process.